I was looking through the photos on my phone and found this shot from this past August. It was a really memorable experience seeing the core of the Canadian government and learning a lot more about the country I’ve called home for just over 12 years now. If you ever get a chance to visit Ottawa, do it. Your country or not, you’ll be guaranteed to broaden what you know about the world. The radio day job always gets me into places around Vancouver that I would probably not wander through if it weren’t for the opportunities that keep coming up, and Empire Field is no exception. TEAM Radio is the official broadcaster of the BC Lions, so during our initial test setup for the first home game back in June, I brought my camera along to hopefully snap some photos of the field before the public got to wander in for a peek. What I didn’t anticipate was that while the first event to be held at this temporary stadium was just days away, workers were all over the place, still getting ready. While BC Place[wiki] gets a new roof downtown, Empire Field[wiki] has been built on the former site of Empire Stadium[wiki], which used to be the home of the BC Lions Canadian Football League team prior to moving into the dome in the early 80’s. The crazy aspect to this stadium is that it’s completely temporary, but I find that hard to tell at times. Aside from the field turf and the four sets of lights at each corner of the stadium, all of this will be gone by the summer of 2011. 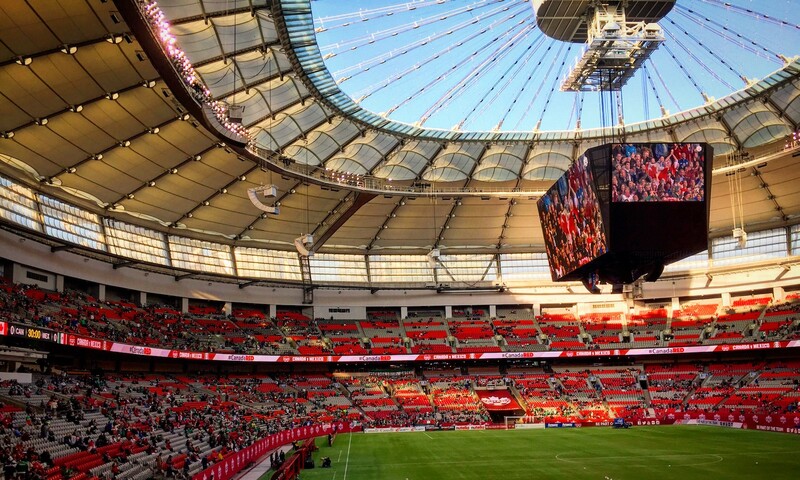 The BC Lions get one full season to call this place temporarily home, and the Vancouver Whitecaps FC will start their inaugural MLS season on the same field. In all actuality, I’m not an overly huge football fan. I like to watch it, but I don’t actively seek it out. That doesn’t mean I don’t appreciate the sport by any means. I’ve certainly let the CFL grow on me, even though punting the ball on 3rd down continues to throw me off from time to time. What can I say? I grew up in small town America where Friday nights belong to high school football, Saturday’s are for college ball(Go Hawks! ), and Sunday was NFL. Four downs(CFL has three), the flags are yellow(CFL flags are orange), and the only time you can score a single point is kicking the ball through the uprights after a touchdown(I’m still confused by all the various ways you can score a single point in the CFL, but oh well). I encourage football fans with the NFL Network in the states to try and catch some of the CFL broadcasts they will be running this summer. Let the rules and twelve men on the field be the second thing you pay attention to. The action is what you should focus on. It’s really tough to comprehend that this stadium will only exist for barely over a year. With the mountains as a gorgeous backdrop and the close proximity of the fans to the field, this isn’t just a great place to watch football or soccer. I could see this being a great outdoor concert venue as well. Whatever happens to this place in the future, it’s a little rewarding to be involved in a tiny piece of Vancouver’s history. Just like people talk about Expo ’86 or when the Olympics were here, I can say I was there, running around the field, ducking into the double-wide trailers that make up the locker rooms, and hauled plenty of equipment up and down stairs to make the radio side of things happen. Interestingly enough, my photos have made the rounds on a handful of sites promoting the environmental sustainability aspect of the stadium, most noticeably the recycled tires that makes up the field turf. Inhabitat used my photos to highlight the use of “22,000 recycled tires, amounting to 346,000 pounds of crumb rubber,” in the field turf that makes up the playing surface of Empire Field. While that’s pretty cool in itself, the playing field can actually be altered in terms of response by either vacuuming up those tiny bits of rubber or adding more to change the amount of bounce you get from the field. They found my photos on Flickr and published them in a post with proper attribution. That’s social networking done right. I was contacted directly about using my photos in this post, and that request was in English. As you can tell by the title of this post, all of this site is in Italian. Ecopnues is an Italian website that focuses on the use of recycled tires, taking a cue from the previous post I’ve already highlighted. What fascinates me is the theme of sustainability being immensely popular around the world. Empire Field certainly has its critics, but in the bigger picture, the long term benefits to the communities around this area is viewed positively by many. Rebecca also has a post with many of my photos as well as her trip to see the field on the day it was unveiled to the media. Empire Field is a limited time experience and well worth it. If you go and are the adventurous type, get some seats in the end zones. Space was so limited in the construction of this stadium that they couldn’t put nets up to prevent balls from going into the stands. How’s that for a souvenir? Well, that is if you’re willing to work for it. I literally had my camera in my right hand but at hip level when I looked down this alley as I walked past and decided to hit the trigger for kicks and giggles. For the first time in a long time, I actually hit a decent perspective of a downtown alleyway in Vancouver, give or take what some locals might consider “typical”. My coverage of the Vancouver 2010 Winter Olympics came and went like a dream. It’s hard to imagine that it actually happened yet alone that the closing ceremonies were just a few weeks ago. I wandered down to the cauldron after work the other day to snap some pictures of the flame while it burns for the remainder of the 2010 Paralympics. I’m ashamed at my lack of coverage of this portion of the games, but there is simply not enough time to get out to everything that I’d like to with the day job taking up much of my weekdays. True North Media House, on the other hand, has been going strong this entire time. There has been a great representation of social media generated content during the Paralympics, probably giving more timely and accesible coverage to these events than what the official broadcast rights holders are producing. At least what I know is that if I want to know how the sledge hockey games are going, all I have to do is tune into Twitter for score updates. Shortly after that, you can expect to see photos on Flickr with the tnmh tag. That being said, seeing the flame burning in the light of the setting sun, I thought I’d go back through all of my own pictures and highlight some of my favorite shots. It already seems like the last day of the Olympics were months ago, and it barely seems like the greatest hockey game that I have ever seen yet alone been in such close proximity to. This was probably one of the single, biggest days in this country’s history, and I was in the midst of it all. And truth be told, I took the photo of this sign the day before this day. It really should have been a sign of what was about to come. Many people probably know about how the USA had a hockey game with Canada for the gold medal. If not, read this. What many people in the U.S. probably don’t understand is that this game isn’t a matter of bragging rights. While that can and most likely will happen, it goes beyond that. This game was the cherry on top of the Canadian pride that has come out of hiding and been embraced like I’ve never seen before.